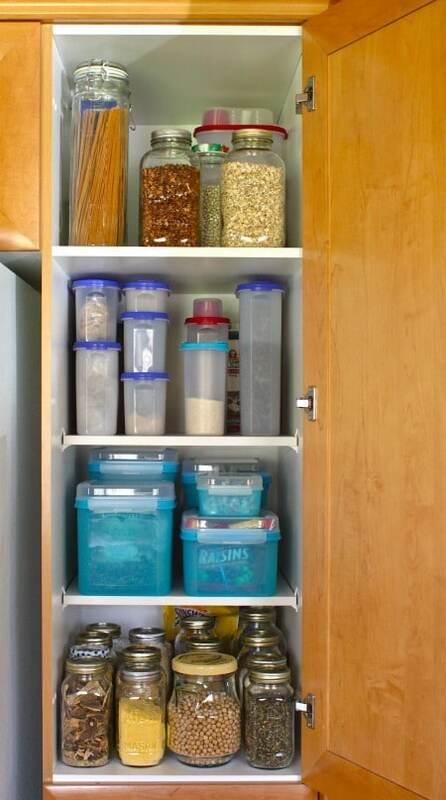 Thank you for sharing how you store your pantry ingredients. I really enjoyed it. I love to store things in jars and containers, but I do not use them for everything. You might have convinced me to try it for more items like granola bars, crackers, and other snacks because I love how organized your pantry and cupboards look. good to know all of this information! now, excuse me, i’m going to buy some glass jars…. Don’t go buy glass jars… Just collect them as you empty out products that come in glass jars already – jam, pasta sauce, pickles, etc… No money spent, no glass heading to the landfill. Or scope out a few garage sales this spring. There’s a long weekend coming up – it’s usually popular for garage sales. Also, ask friends/family members if they have any jars you can put to use. i didn’t think about that. good idea! thanks! Very few things I buy in glass jars come in BIG glass jars besides pickles–I’m saving what I can but in the meantime, Walmart sells some nice gallon size glass jars, I bought a half dozen for the kids snacks and lined them up on the counter. (I’ve heard Ace sells half gallon canning jars but haven’t checked) It sure speeds up lunch packing to have everything lined up in jars like that and it’s cut WAY down on the number of times the kids bang the pantry door open and closed in a day looking for a snack. I asked for jars and before I knew it I had bags of them being dropped off! I do not use canned pasta sauce or any items that come in jars really so all I did was ask my friends! It is a great idea and very green! I just don’t like pickle jars because I can never get the pickle smell out! Use baking soda and water to get rid of smelly jars! Fill the jar with water, stir in a couple of teaspoons of baking soda/soda bicarbonate, let it sit over night before you wash the jar. What a great guide for being well organized in the kitchen! Thanks. Thanks for the containerization link! I hadn’t discovered simple bites when that was first posted, but I needed to read those tips! I see I’ve been missing the obvious–I store art supplies in old glass jars (and love the rustic look, like you said) but it never occurred to me to dump my legumes, nuts, oats etc in those as well. I vastly prefer glass to plastic, but have been using plastic for all those things. Thanks for this. I have been looking for a better way to store things in my pantry. I’m changing over to using more dry beans instead of canned and was trying to figure out how to keep everything organized and contained and definitely away from critters. I do not want that! This post has been very helpful. Please come fix my pantry, it’s ubber scary 🙂 Great tips by the way, now I just need to get busy. I’m seriously impressed, Aimee. Your pantry is so organized! I love it. Awesome, Gina! Of course, it isn’t always this nice, but all the containers do help the sprawl. Thanks for letting us peek in your pantry, Aimee. I’m so glad that Eat Well, Spend Less is going to be a regular monthly feature. I learn so much and feel like my budget is benefiting, too. Can you swing down to the US and do this to my cupbards??? Great tips girl! Are you making cake? Then YES! I keep my flours in my fridge. Should I move them to the freezer? I love the look of your pantry. I need to get some mason jars, stat! The fridge is definitely fine as long as you have space (I have more room in my deep freeze) and you are using the flour up within a few months. Since I have a very small pantry space, I’m usually pretty good about using everything in my pantry…. except half a bag of dried split peas that I have no desire to use or recipe to use them for. They’ve been in there way too long, and I might decide to dig up a recipe for them before it gets too warm. You are so organized! 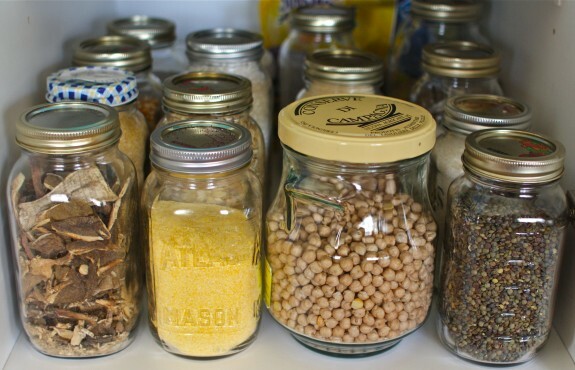 I never ever thought to use glass jars in my pantry, but that is brilliant! I already a pantry disaster this spring. Ants! Lots of ants. The first time in three years. I hate ants! You should see my collection of glass jars, none of which I bought. I just keep recycling anything I buy that comes in a good glass jar and re-purpose it for everything, even storing leftovers in the fridge. Love the organization! Thanks for the tips. I’ve been reading a lot about BPA in hard plastic. Does Tupperwear have BPA free containers? I love your pictures! I stumbled onto your blog this morning and I already subscribed. I have most of my pantry in glass or plastic as well. I really like the convenience of it all. Plus, it looks so much prettier! I have modular mates that I have been using since 1984. I absolutely love them. I never thought of using canning jars. I have far more of them than I need, as I inherited many from my grandmother. I’ll have to take a look at going through my pantry. One thing I do, in compliment to the above, is to cut off the instructions of the package I bought my legumes, grains, etc. in and either tape or just stick it inside the glass container storage. Too many times I transfered something from its original package into a storage jar and then for got the water ratio or cooking time suggested! Great article and advise. I have never seen a pantry look so good! Your skills are wonderful! I love the level of organization shown here! This is going to be by summer project! Great tips, Aimee. What a fantastic post… I have small bags (half used) stuffed in zip top bags of beans, legumes, and pasta… I almost always end up buying more not realizing there’s so much already in the cabinet. This would totally stop the extra spending (and wasting!) I believe I have some jars in the basement! I also love the idea of saving jars as you use them… I’ve been doing that for storing leftovers in the fridge, but hadn’t thought of it in this way. Thanks! I am all about the jars! I got lucky and inherited about 200 from my hubby’s grandma…. i store everything in them! i love your organizing! Your pantry is beautiful! I use the Jars For all my grains, too. But i somehow still end up with pantry moths. So I stopped buying more than I can use in a month. Id love to purchase in bulk, but I’m afraid those bugs will get to my grains and legumes and ruin my purchase. Any tips for keeping the worms and moths out? Try taping a bay leaf on the bottom of each of the shelves in your pantry. I’ve never tried this, but have kept it in my mind to try if I seem to need something else. Hi – just thought I would tell you I put bay leaves in all my dry goods (oats, rice, flour, beans, etc). I’ve been doing this for 30+ years with no bugs. I buy in bulk and store everything in glass jars or big plastic buckets. Hope this helps. your organized pictures inspired me to finally move some of my bulk in bags to the glass jars i had waiting and also process my azure order i picked up and make my pantry look better. Love your blog. This article is so helpful on so many levels. Thank you for clarifying each of the types of foods for each type of storage use. So helpful. I have done the container organization method with my fridge, and it rocks. All ingredients for a specific meal are together in a container – and the container is labeled with the day of the week I’m making the meal on. It rocks. for any canning jars, do you glue the lid onto the ring at all? i imaging it being a pain to have to unscrew the ring and then take the lid off. I so want to live in your kitchen! Love your pantry! I always am looking for glass containers for storage. One day all my pantry items will be in glass- yours looks fantastic! I just wanted to let you know I sell jars on etsy that can help your pantry organization.